Cabo Polonio is famous for its lighthouse constructed in 1880 to deter potential shipwrecks from crashing into the peninsula. Just some of the signs posted around peoples homes raising awareness about environmental protection and cultivating meaningful connections with other people. In 2009, Uruguay established Cabo Polonio National Park with the goal of protecting its unique ecosystem and historic fisherman population through limiting tourism and controlling who can live in the park. The curious village of Cabo Polonio is about a two hour trek into the national park or a fifteen minute ride on a two story 4x4, ideally located on a peninsula extending into the Atlantic Ocean and occupying no more than a square kilometer. The permanent population of about 50-100 residents are nearly all descendents of families that have lived in the area for generations. 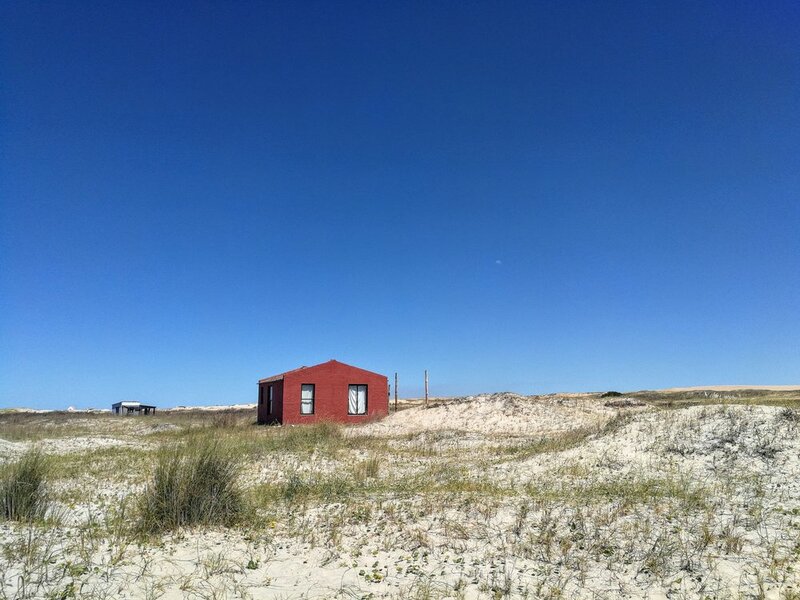 The local economy of Cabo Polonio once depended on hunting sea lions, now protected under Uruguayan law; today, the historic residents of this remote beach town rely on year-round fishing and seasonal tourism for their main sources of income. What Makes Cabo Polonio Unique? Everyone who has been to Cabo Polonio will tell you it’s something special - an experience that is difficult to put into words. It is one of the increasingly scarce places where you can get completely lost in nature, with only the wind, ocean, and sand dunes to limit you. Perhaps the most distinguishing characteristic of Cabo Polonio is that most residents live completely off the national power grid and without running water - a rare sight in modern day Uruguay. Instead, locals source their power from solar panels and mini wind turbines connected to their homes and access fresh water through collection of rainwater in tanks along with filtration of groundwater using plants. Especially popular with artists and environmentalists, Cabo Polonio is an escape from overcrowded cities that embrace unnatural and unhealthy living. Scientific research and data is showing that city life may be contributing to increased risk of mental health issues, respiratory problems, violence, and obesity. Locals in Cabo Polonio are fighting hard to safeguard their town from the ills of modern life and overdevelopment. Signs scattered around the town with messages such as “Cabo Polonio, Dejalo ser” (Cabo Polonio, let it be) aim to raise awareness of the increasing threats to the Polonian way of life. This simple, yet profound motto, sums up the feelings of locals towards the push from modernity and tourism to develop their town. Cabo Polonio is one of the few places in the so-called developed world where you won’t have the privilege of being alone, hiding behind your busy schedule and smartphone. Even if you may want to hide behind a screen and avoid socializing with the people around you, the lack of wifi and inclusive mentality of this beach town will give you the gentle push to interact face to face with both residents and visitors. Of course, living in advanced cities provides many advantages and opportunities to city dwellers around the world, but spending a weekend or a week in Cabo Polonio will provide more insight into the trappings of modernity which we have become accustomed to overlooking in our daily lives - the constant noise, air pollution, overcrowded spaces, and rising addiction issues. With more than half the world’s population living in urban areas, preserving natural places like Cabo Polonio has never been more important. Noctilucas are a marine-dwelling species that exhibit bioluminescence when disturbed by motion. One of the most incredible things about Cabo Polonio is that the ocean lights up at night with bioluminescence created by noctilucas, or sea sparkles in English. Noctilucas are a marine-dwelling species that exhibit bioluminescence when disturbed by motion. Try to visit Playa Sur on a particularly dark night, preferably during a new moon, and you might see this unbelievable natural phenomenon. My entire visit to Cabo Polonio was motivated by my desire to see the bioluminescence, and I managed to see it on the second night… MIND BLOWN. The light emitted by noctilucas maybe faint if other light sources are present in the area, so sitting on the beach for about an hour will increase your ability to see the light as your eyes adjust to the darkness. Try running your fingers through the sand where the water meets the shore and then watch the sand sparkle as the noctilucas scatter away from your touch. Cabo Polonio is a famously vicious site for shipwrecks, with its devious peninsula reaching out into the Atlantic. In order to prevent further wrecks, fishermen and seamen of Cabo Polonio constructed a lighthouse in 1880 to save those navigating in the dark nights on the coast. Today this picturesque, lonely lighthouse is the cultural symbol of the town and gives visitors a lovely view of the park, as well as the sea lion colony below. A climb to the top will cost you just $25 pesos. A handful of houses rent surf boards and offer classes to visitors. Check at your accommodation for directions. Cabo Polonio is home to the second largest sea lion colony in Uruguay. The livelihood of Cabo Polonians once depended on hunting sea lions, before the Uruguayan government legally protected them with the establishment of the national park in 2009. From hiking along the endless beaches that extend out as far as the eye can see, to trekking deep into the pine forest in the center of the park, to running up and sliding down massive sand dunes, this park offers a variety of hikes to satisfy nature lovers. Stop by the visitor center near the bus station when you arrive or ask your hostel/hotel about popular routes for more information. The only ATM in Cabo Polonio National Park is at the bus station, a two hour walk from the town. Some hostels will let you pay with card (For example, Hostel Lobo Viejo), but everything else around town is done in cash, so bring enough to last the duration of your stay. Restaurants around town offer tons of vegan and vegetarian options for plant-based travelers. Before leaving Montevideo for Cabo Polonio, I looked at other travel blogs and forums about what to bring; most said to bring food since only one store stays open in the off season (May to December) and products are limited. But of course, being the unorganized traveler that I am, I completely forgot to bring food. Turns out these blogs were outdated. Arriving in the beginning of the off season, I was surprised to find three stores open with fruits, veggies, and tons of packaged food like pasta, beans, rice, wine and most importantly, beer. Unless you have a serious dietary restriction, there is no need to bring your own food. If you went to Cabo Polonio several years ago, asking about wifi would have been laughable and cell phone reception completely out of the question. However, times are changing in this quaint little city. Some hostels and hotels offer limited wifi for an hour a day to encourage social engagement, but a handful of accommodations are still without connection. As for cell phone reception, you will get a full 4G signal around town (I used Antel as my carrier and had no trouble getting a signal). Unless you rent a 4x4 truck, plan on leaving your rental car at the parking lot in the entrance to the park. The lack of paved roads and massive sand dunes make it near impossible for normal vehicles to successfully make the trip into town.